This St. Patrick's Day decoration is a green and white shamrock bunting that you may hang indoors or outdoors. This green and white shamrock bunting has metal grommets for easy hanging. The St. Patrick's Day decoration with festive shamrocks is 100% polyester and measures 39" wide. 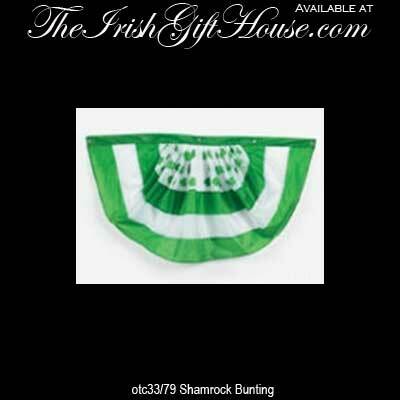 This shamrock bunting from The Irish Gift House is ideal for hanging on any railing or use it as a St. Patrick's Day parade float decoration.